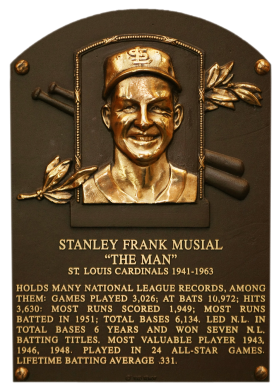 Originally signed as a pitcher, Stan Musial hurt his arm and transferred to the outfield. 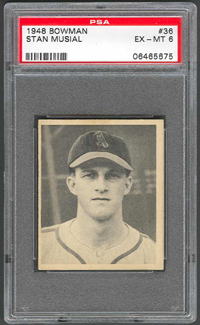 Joining the Cardinals in 1941, Musial batted .426 in 12 games, and he went on to lead the NL seven times in batting average. NL MVP in 1943, '46, and '48, he used his "corkscrew" batting stance to hit over .310 for 16 seasons in a row. At the time of his retirement in 1963, "Stan the Man" held more than 50 major league and NL records. He had a career .331 batting average, 3,630 base hits, 725 doubles, 475 home runs, 1,951 RBI, and 1,949 runs scored. 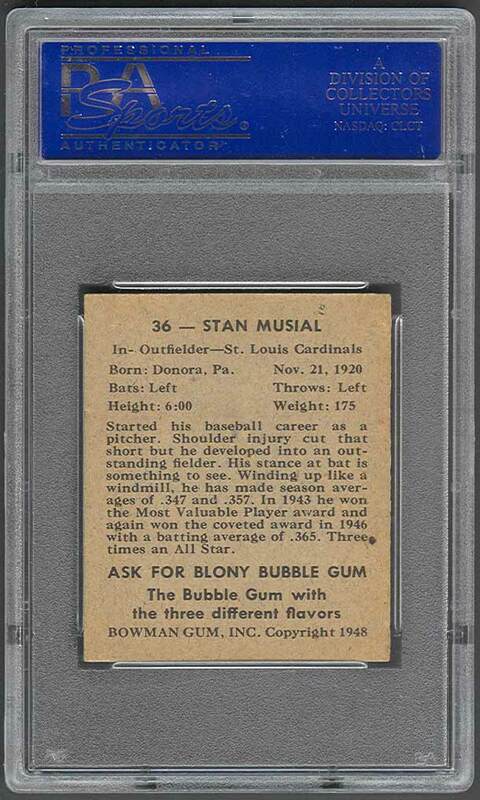 Comments: I remember buying a 1961 Topps card of Stan Musial sometime in the late 1990s. I think it was a PSA 7 which I sold in Oct 2003 because I upgraded to a PSA 8 in January, 2000. In Oct 2006, I replaced the 1961 Topps with a PSA 5 1948 Bowman rookie card via eBay. I didn't have a single card from the set and gained a new type card. One month later I upgraded to a PSA 6 when a good deal came along on the bay. 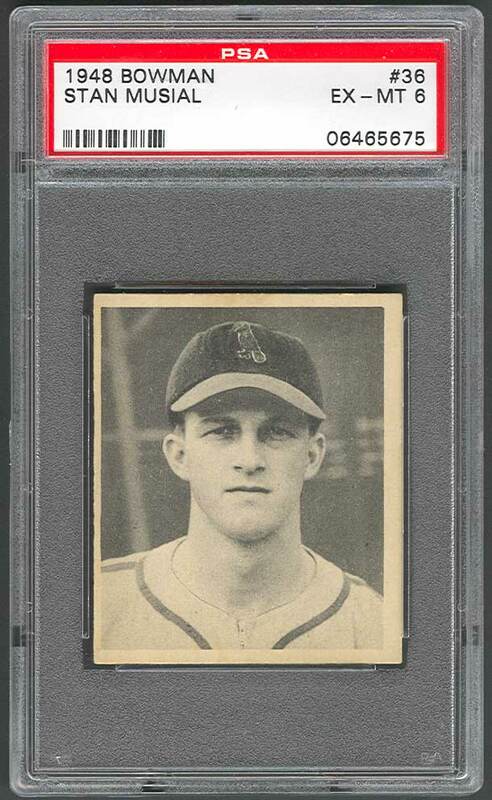 This Musial rookie card is in great shape - EX-MT with centering off left to right - solid example. 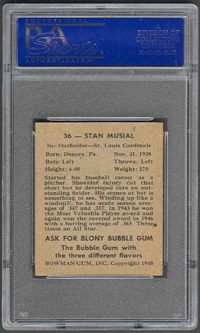 Description: Bowman Gum Co.'s premeire set was produced in 1948, making it one of the first major issues of the post-war period. Forty-eight black-and-white cards comprise the set, with each card measuring 2-1/16" X 2-1/2" in size. The card backs, printed in black ink on gray stock, include the card number and the player's name, team, position, and a short biography. Twelve cards were removed from the 36-card printing sheet to make room for the set's high numbers (#37-48). These 24 cards command a higher price than the remaining cards in the set.